Creating Passionate Users: F*** the rules! How often do you question The Implicit Rules? How often do you challenge The Assumptions? How often do you make sure that you're not doing something a certain way simply because that's the way it's done? How often do you recognize when others are judging, criticizing, or trying to guilt-trip you based on some unstated rule about How People Are Supposed To Be? How often do you call someone on it? When I hear someone say, "Everybody does it this way", or ""Everybody knows this is appropriate behavior under these circumstances...", I try to ask, "Who wrote that rule?" Make sense, but only in a different context. One of the things that makes challenging the rules so damn hard is that other people have so much invested in... keeping the status quo. And of course the minute you question a rule, you're potentially threatening the people who've been following that rule... even if those people don't understand the rule either! Simply hinting that there could be a better way is enough to trigger someone's defenses. Another problem with questioning the rules is that they're so pervasive, and we just come to accept them. Just as memes and urban legends and "talking points" become real simply because they're repeated, rules take on a life of their own even when nobody can remember why they exist in the first place! A huge chunk of the implicit professional rules today are damaging because they inhibit innovation. They stop the one thing businesses need the most--breakthough ideas. Yes, one could get into trouble at work for asking too many questions about The Rules, but what have you got to lose? Your job? That might have been relevant a few years back, but it's becoming less a factor today. Sure, you definitely could lose your job (like, um, me) for asking too many "but, WHY?" questions, but if you don't, your entire company, or perhaps an entire industry could start slipping under the waves, anchored by inhibiting, outdated, or just plain stupid rules. At Sun, I used to hear "Customers don't want that." Or "Customers need you to do it this way." And I'd always ask (nicely at first), for the evidence. "How exactly do we KNOW this?" Who decided that? If we ever did know that was true, is it STILL true? And on I went... you can see how annoying I was. If we'd followed The Rules when designing the original Head First book (Head First Java), we would have been simply one more of the 2,000 other currently-selling Java books, with virtually no way to break past the established, well-loved existing books. Even a spectacular marketing campaign would not have been enough to even earn back our advance. We simply looked at every rule and constraint and said, "let's pretend these don't exist... what can we do to implement the metacognitive learning principles so that people can learn more quickly, with better retention, than with most traditional approaches?" Because of their willingness to challenge the rules, it's O'Reilly (and not Sun Press) that has the top four selling Java books right now. : ) The amazing part to me is that O'Reilly, having invented and established many of those rules, had a lot more at stake in breaking them, but that's Tim for you. "When was the last time anyone verified that?" » G_d loves irony from "Hello_World"
Thanks for saying what a lot of us have been trying to say for a long, long time. I don't know where you learned all that you know about sales, marketing, advertising, etc...but I sure wish more people lived near there. Thanks for all the articles that make me think, laugh and wonder. This site always gives me so much hope. The difference between the way-things-are and how-they-should be always seems a little less after I read the articles here. Heh and I've been 'short-timer' jeff (lmao btw) on more than one occassion because of this very thing! Outstanding post. "Great Leaders ask the right questions to the right people to get the right anwsers." Question everything. Question often. Rules are for beginners, who need recipes. Experts are hindered by rules. The question is, do you really want a company full of beginners? This also seems to be a cautionary tale about the corporate culture of Sun compared to that of Microsoft. I see disturbing parallels with Java vs. NET, too (checked exceptions?). In the long run, the "screw the rules" approach will win, because it's more flexible and experts perform better in that environment. You'll never make it to the future if you don't question the past! It's not so bad being a short-timer! You have to read Tom Peters' book, Re-Imagine, which very much relates to what you've written about here. Screw "out of the box"--who says there is a box? It's the company that sets the rules AND who breaks them who wins. Nice plug for O'Reilly. They are always on top of things. Also, how do you feel about Sun being blog-enabled? Supposedly they are opening themselves up to the customer. I'd love to see a blog on that! It sparked me to create a series of diagrams for the "Life Cycle of Rules". (I tend to be very visually oriented). There is a link to the file from my blog (www.theshot92.blogspot.com) or directly via my website (www.notewordy.com/LifeCycleOfRules.pdf) if you are interested. We certainly need to question the Rules but I think it also helps to understand what the value is of Rules (and when they start to lose their value). Jory, I just found that book a couple days ago, after losing it in one of my recent moves ; ) (I can't seem to decide where I want to live, although it's looking like Durango CO might be my next stop), and I'm enjoying it. Just the idea of DK doing a Top Peters book that goes in the business/management/marketing part of the bookstore is breaking a few rules, regardless of the content. Jeff Atwood, hmmm... now you have me curious about your java vs. .NET and The Rules thing. Given that I have almost zero .NET knowledge (other than a rough understanding that C# looks and works a whole lot like Java), I'd like to hear more about that from you. You got me thinking. Dave, that "Lifecycle of Rules" ROCKS. Thanks so much for telling us about it. You should seriously branch out, and apply your approach to every topic that needs to learned! Even though I ended up not using Java much, I was just in love with the Head First book, and all my friends who teach knew right away there was something special about it after a quick nosing around in there. Also, I think your comments sections could really use a box around each comment, or a line between, or something. It's hard to tell where they end. But keep on questioning the status quo and questioning everything. That's the way to be! Many moons ago, the fellow who had hired me fresh out of college sent me out to do some on-campus interviewing of potential job candidates. We already had a very young department, with nobody over 30, so I asked why he felt we needed to add yet another round of people with no industry experience. His answer was "Within a year, everybody in this business knows way too much about what can't be done. I need people who don't know what can't be done to come in and keep proving us wrong." On ... I think it's changethis.com ... there was recently an editorial someone had submitted in favor of giving all laws expiration dates. Kind of different but not that different. To say Higher Education is an entrenched beast is the understatement of the era. I couldn't agree more with Rich's first employer. During our restructuring last year I hired a fresh-faced, won't-take-any-sh*t-from-anyone-and-always-questions-things Geordie lass to run one of my teams. I have got more done through her than through all those who have been here for ever and have all the historical it's-always-been-done-like-this crowd. Thanks for these posts, this has lightened my psyche as I was getting bogged down in the mire of others' unwillingness to see things differently. But one needs to master the rules, before one can break them! That is an issue which is forgotten. break the rules, but only after they had mastered them. That is the issue. Even the rule "Have no rules" can be constraining! Kathy's got it just right when she introduces clear consciousness into the rule-playing world. What are the spoken and unspoken rules that shape us and our actions? Are the rules I followed in the past the right ones for the present? Will they take me into the future I desire? What is the Short List of Simple Rules that I can follow all the time to generate some coherence for myself without overconstraining my freedom to adapt and create? 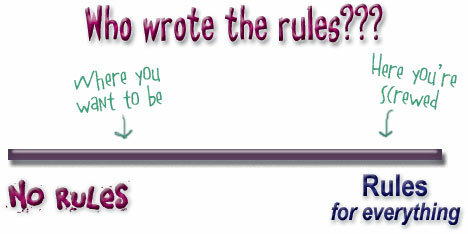 How can I start a conversation "about" the rules, rather than constantly working "within" the rules? Thanks, Kathy, for sparking a cascade of rule-breaking questions for me. I like the quote "Rules are for fools... and the guidance of wise men! ".